Just because some remote control (RC) tanks are advanced doesn't mean you need to be. These tanks are great for almost any skill level and are loaded with options. RC tanks have amazing features such as real smoking engines, motor sounds, and functional turrets. Mount a wireless camera, on your remote control tank. Need an extra effect? Some of our tanks have working turrets to allow you to engage in simulated missions to gun down your enemy. 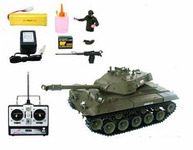 Shop the best RC tanks, RC helicopters, and toys for sale.